There are a huge range of equine hoof boots for sale that offer almost every horse a viable alternative to metal horseshoes. They are designed to provide extra protection for your un-shod horse without causing detriment to the hoof. They can be used for all types of riding, including trail, jumping, dressage and endurance as well as for driving, rehabilitation and turnout. They come in a wide range of sizes to fit miniature horses, ponies, horses, and medium-sized drafts. This page gives you an overview of all of those boots so that you can easily find the best hoof boots for your horse. It may be necessary to use hoof boots for a while when you first start transitioning your horse to go barefoot. Often a newly de-shod foot is not able to cope with the varying surfaces you may encounter when trail riding or during turnout so boots are used to make the horse more comfortable until the hoof has built up condition. 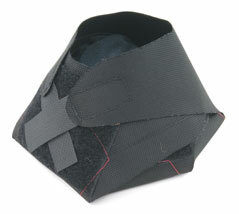 Many horses also need equine hoof pads in the boots for additional support. Some shoeless horses are lucky and don't need them but for most horses it is something that you do need to invest in (even if only for occasional use). The majority of horses only need them on their front feet. They can also be used to make a horse more comfortable when they are suffering from abscesses, laminitis/founder or navicular. Another scenario where boots are useful is if you keep your horse on a soft terrain but want to ride on hard, abrasive terrain. It is not fair to expect the hoof to cope with the harder terrain when it hasn't been conditioned to it, but by using hoof boots you can overcome this issue and keep your horse comfortable. Some have accessories which help prevent rubbing. Also there are pads available that can be used on sensitive horses or to help stimulate weakened areas of the hoof, such as the frog. By cutting the pad into the shape of the frog and either taping over the frog or attaching it to the boot, extra stimulus is provided to help develop the frog and digital cushion. Pete Ramey has written a great article on the use of boots and pads click here to read it. This page gives you the chance to review and compare the wide range of boots that are available so that you can get the best horse hoof boots for your horse or pony. 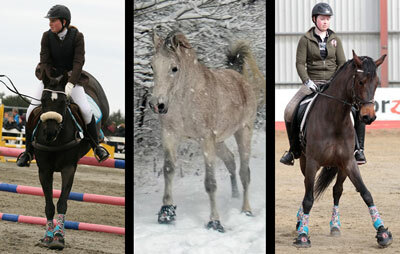 The riding group has been revolutionized by the introduction of the flexible-soled hoof shoes made by Equine Fusion. Up until 2011, most of my experience had been with the Boa's, Old Macs and Easyboot Epics and out of those three my preference for riding was the Easyboot Epic. However all of these boots have a rigid sole which whilst is infinitely better than regular horseshoes still does not allow the hoof to function as naturally as it could. 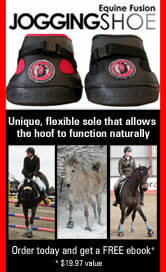 The Equine Fusion Jogging Shoe however has a totally flexible sole which does not impede the hoof in any way. I personally think this is the way forward as recent research by Dr Bowker indicates that sole stimulation is very important to the hoof and helps increase blood flow to micro-vessels in the hoof. I like these boots so much that I became a dealer - click here for more info. 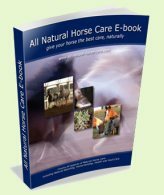 Having said that I still list all of the available types of boot because they all have unique benefits and the final decision should be based on what your horse's needs are at the time of purchase. The photo on the left shows a hoof in a well-fitting Easyboot Bare. The boot has been cut to show how the hoof fits snugly into the boot and also illustrates how breakover is actually improved by this hoof boot - many people wrongly assume that breakover is extended when using boots. Each manufacturer has slightly different size ratios so you may find some boot shapes more suitable than others for your horse's individual foot shape. This is an important fact to remember when deciding which boot to purchase as the better the fit, the less problems you will encounter. It can be much more tricky to get a good fit if your horse has a particularly round hoof or if it is wider than it is long. Scroll down and click on the links to get a detailed description about each type of hoof boot and links to the manufacturer's website. 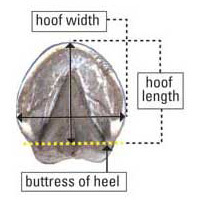 When measuring for hoof boots, it is important to match the width and length of the hoof to the hoof boot size. The front hooves of most horses tend to be more round in shape and wider than the hind hooves. It can often be a little harder to find hoof boots for hind feet but there some models such as the Ultimate Jogging Shoes, that come in a Slim version for narrow hooves. Measure the width of the horse's foot across the bottom at the widest point. Measure the length of the hoof from the toe to the buttress line of the heel. The buttress line is the farthest weight bearing point of the heel. Compare your measurement with the proper size chart for the boot. If you are taking your measurements in inches, use the imperial size chart. If you are taking your measurements in millimeters, use the metric size chart. Ideally, the width and length measurement will fit into the same boot size. If the width and length measurements indicate different boot sizes, select the larger boot size. Be sure to measure each horse foot as sometimes one is larger than it's pair. Click on the name or photo to see more information about each boot. Prices shown are the manufacturer's suggested retail price in US dollars (last updated December 2015). These boots for horses are primarily aimed at hooves that need extra protection and padding due to injury or illness. Some are a suitable hoof boot for horse turnout - although this should be in a limited area so as to lessen the chance of the horse loosing the boot. 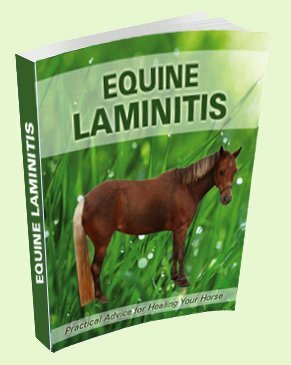 Particularly useful a horse or pony with laminitis and/or abscesses. The smallest miniature hoof boots available are the All Terrain and Ultimate models of the Equine Fusion Jogging Shoes which offer a great alternative to traditional horseshoes for miniature horses. This section includes barefoot riding boots for trail riding and arena work. 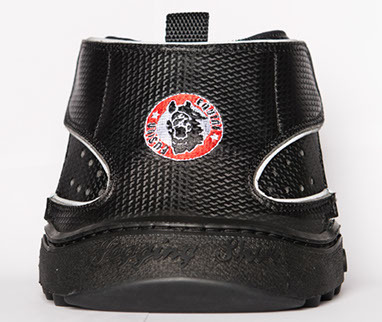 Some of these boots, such as the Equine Fusion Jogging Shoe, can also be used for turnout. Some of the manufacturers also make equine hoof pads that can be put in the boots to give the horse additional hoof protection. 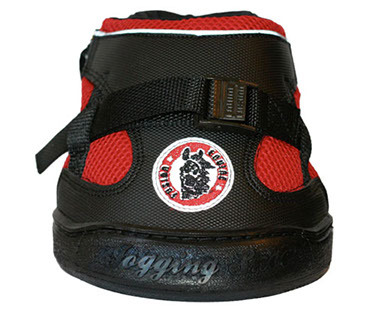 The smallest horseshoes for miniature horses are the All Terrain and Ultimate models of the Equine Fusion Jogging Shoes. Downloadable eBook with detailed instructions and clear photos on how to make your own Hoof Jack.